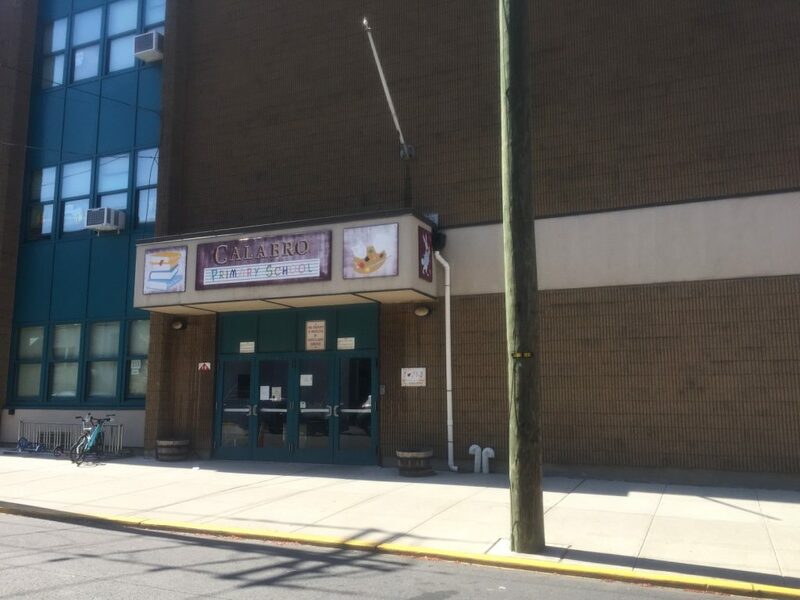 In order to meet budgetary and spacial constraints, Calabro Primary School may merge with Brandt Elementary School, three blocks north. Facing increasing enrollment and a reduction in state aid, the Hoboken Board of Education will make a decision about whether the district should combine Calabro and Brandt elementary schools to help provide enough classroom space and address the district’s funding shortfall in the 2019-2020 budget. Last week, superintendent Dr. Christine Johnson met with the Parent-Teachers Organization of Calabro Elementary School at 524 Park Ave. to discuss the district’s financial and physical challenges and three options which the board will consider before the budget is adopted in May. Board of Education President Sharyn Angley explained some of the district’s challenges. “In addition to the annual cost increases one might ordinarily expect a budget to anticipate, labor costs, energy costs, etc., the presentation highlighted extraordinary challenges Hoboken faces,” she said. These “extraordinary” challenges include the loss of $527,524 in state aid this year and the projected loss of an additional $450,418 in state aid next year. The district also has to plan for contractual salary increases, a 9 percent health insurance increase for all staff members, restrictions on the tax levy cap, and the charter school tuition increase from $10,100,707 last year to $10,385,484 in 2019-2020, all of which are in the district’s 2019 proposed budget. The district has also projected an increase of 15 percent in kindergarten through 12th grade enrollment, from 2,812 to 3,195. From kindergarten to fifth grade enrollment is projected to increase by roughly 300 students from 1,198 this year to 1,430 next year. Currently, Hoboken provides 17 kindergarten classrooms of 16 kids which will climb to 20 classrooms of 20 kids next year. The state has also added seven additional Pre-K classes next year. The mandated Pre-K program for three and four-year-olds will serve 990 students next year, a total of 66 classrooms. Currently, Pre-K classrooms are at Brandt, Wallace, Connors, the AJ Demarest building, the Rue building, and St. Francis church. The district has addressed increased enrollment by moving sixth grade students to the middle school this fall. This first step frees up two classrooms at Connors Elementary School, five classrooms at Wallace Elementary School, and one classroom at Calabro Elementary School. Pre-K classes will be moved from Brandt into Wallace and Connors schools. Connors School will pick up two additional Pre-K classes and up to two additional kindergarten classes. Wallace School will pick up five Pre-K classes and up to two additional kindergarten classes. Demarest will also pick up one additional Pre-K class. This will give Brandt eight additional classrooms to accommodate either fourth or fifth grade classes and the ability to add additional kindergarten classrooms. These initial steps are not enough, so the Board of Education will consider three options to balance the introduced budget and to help the district meet its financial and space challenges. One option would be to move seven Pre-K classrooms into Calabro, and leave preschool disability classrooms at Wallace. In this option, the current Calabro students would not need to leave the school. First through fifth grades would be on the fourth floor, as well as on the third floor mixed with preschool classrooms. This option would feature a joint school supervisor and early childhood supervisor between Calabro elementary students and preschool students as well as a shared nurse. The disadvantages would mean that Calabro’s Passport to Learning after-school program would be held at Brandt School. One custodial position and one administrative position would be eliminated. Three central office positions would merge into one. And some of Calabro’s operating and administrative expenses would be shared with the Pre-K program budget but the district would still need to consider terminating district personnel to further reduce costs. Another option would be to move seven Pre-K classrooms and the three Pre-K disability classrooms currently at Wallace into Calabro, repurposing the building as an early childhood learning center. Students currently at Calabro, apart from those graduating into the middle school, would move to Brandt School, three blocks north. This option would allow the district to maintain all the programs, reduce the cost of Passport to Learning because it would need to be held only at Brandt and maintain its staff, which would be shifted to the Brandt School. It would also allow the district to charge the operation of Calabro to the Pre-K budget to help recoup funds. It would charge for before and aftercare programs, which would enable Passport to Learning to generate revenue to supplement the kindergarten through eighth grade program. The Board of Education could also choose to leave everything as is. This would mean that the district would need to rent space at market rate to provide the state-mandated additional Pre-K classes. According to Johnson’s presentation, this would be $42 per square foot, not including necessary renovations that would “decimate” the Pre-K budget and not strain the district’s operating budget. It would mean the possible elimination of seven teaching positions, one administrative position, two custodial positions, one security position, and the merging of three central office positions into one. Current programs and services might be cut. One Calabro parent who did not wish to be named did have an opinion. He felt the district had rushed into making a “kneejerk” decision because the district has been discussing these options only for a month. He said that many Calabro parents feel the district has been less than transparent, noting that details were lacking from the presentation, including the specific savings the district would see from sharing staff with Brandt. Also missing were preschool savings and savings associated with providing lunch from a satellite location. The presentation also did not indicate what positions would be cut. Dr. Christine Johnson was unavailable for an interview.